Getting business leaders in one place is the only way to maximize their time and their schedule. That’s what MHI attempts to do at the Executive Summit, a c-level gathering for leaders only. At this exclusive one day event, manufacturing and supply chain executive leadership will focus on the trends and topics facing supply chain and material handling companies today and over the next 3 – 5 years. Topics include industry disruptors, new ideas and technologies, and workforce solutions. Request invite today. 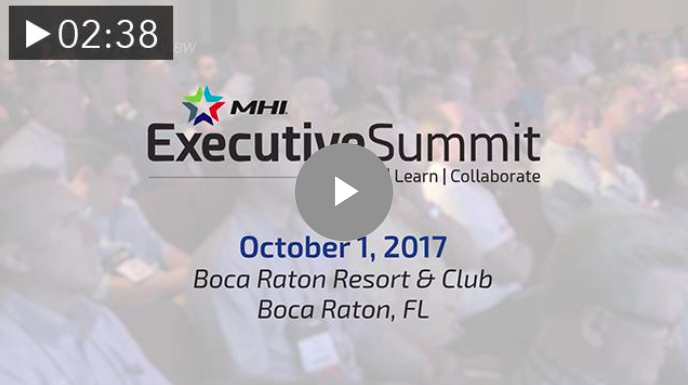 View full preview video of the 2017 MHI Executive Summit. – Senior Level Supply Chain Executives of companies that use or are interested in material handling equipment, software, consulting or integration services. – C- Level Executives from MHI Member companies. Not a senior-level executive but interested in attending? The MHI Young Professionals Network group is sponsoring a NextGen Leadership program. To qualify, you must be supported by and attend with a senior-level executive from your company.